My god, it’s been a while, hasn’t it? It seems so cliché to say how fast time flies but it really is true when you look at the last time an update was posted on here: October 2014! It’s been brutally cold here in New York City so there’s been a lot of cooking to save myself from running outside to pick up lunch during the week. For a while there, I was in no mood to cook. In fact, my new year’s resolution was to take more naps during the weekend. I’m not getting any younger and I’m trying to change the way I while away my free time. I don’t want to feel like I always have to accomplish something. It’s taking a lot for me to say to myself that it’s okay not to do anything. Instead of being unproductive, I now think of it as getting more me time. Part of that is honing my baking skills. I’m not there yet but I’m trying. Lisa and I were talking about Louis CK’s Cinnabon shameless bit one day and it made me want to eat cinnamon rolls the next. I found a vegan recipe that I changed up because I only have the regular kind of butter in my fridge. This turned out not to be too sweet which I liked. It was excellent with hot tea. 1. In a large sauce pan, heat the almond milk and 3 tbsp of the butter until warm and melted, but without boiling. Remove from heat and let it sit until it’s warm. It should not be too hot or it will kill the yeast. 2. Transfer mixture to a large mixing bowl and sprinkle on yeast. Let activate for 10 minutes, then add 1 tbsp sugar and the salt and stir. 3. Add in flour 1/2 cup at a time, stirring as you go. The dough will be sticky. When it is too thick to stir, transfer to a lightly floured surface and knead for a minute or so until it forms a loose ball. Rinse your mixing bowl out, coat it with canola oil, and add your dough ball back in. Cover with plastic wrap and set in a warm place to rise for about 1 hour, or until doubled in size. 4. On a lightly floured surface, roll out the dough into a thin rectangle. Brush with 3 tbsp melted butter and top with 1/4 cup sugar and the cinnamon. 5. Starting at one end, tightly roll up the dough seam side down. 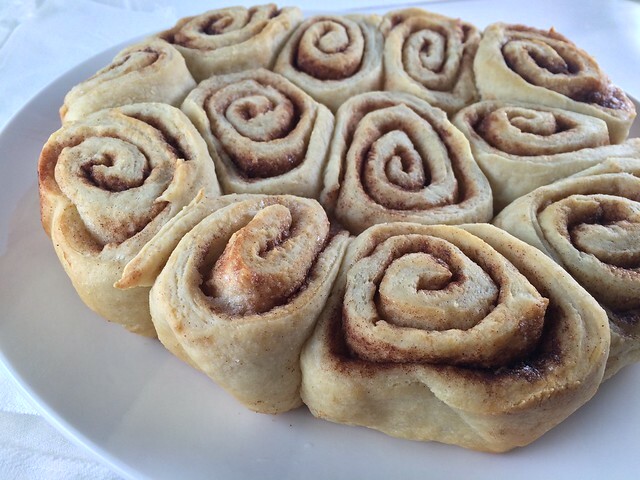 Cut the dough into 1.5 to 2-inch sections and place in a well-buttered round pan. You should have about 10 rolls. Brush with remaining 2 tbsp melted butter and cover with plastic wrap. Set on top of the oven to let rise again while you preheat oven to 350º. 6. Once the oven is hot, bake rolls for 25-30 minutes or until slightly golden brown. Let cool for a few minutes and then serve immediately.